Written by Brook Reilly. July 5, 2012. Plan it properly. Nothing blows a budget faster than making changes after the work is under way. When we surveyed readers about what went wrong on their last kitchen remodel, late changes was the most expensive answer, costing an average of $1,500. For a major kitchen remodel, you should spend several weeks to a few months perusing magazines, meeting with pros, and visiting showrooms. Consider mid-range appliances. A suite of professional appliances could set you back $20,000, but our tests have found that these high-priced products don't always deliver top performance, and you might also be missing out on the latest innovations. For example, several induction ranges costing $2,500 or less delivered better temperature control than beefy 36-inch pro ranges costing twice as much. If you're really smart, you can outfit the entire kitchen, including the fridge, range, dishwasher, and microwave, for less than $4,000. Skip the custom cabinetry. Cabinets can account for half the cost of a kitchen, especially if you spring for custom units. You can save 30 percent or more by choosing semi-custom units. Stock units offer even greater savings, without necessarily sacrificing style. If the layout of the existing cabinets works and the units are plumb, square, and sturdy, you could refinish them with a fresh coat of paint or reface them by replacing the cabinet doors and drawers and applying veneers to the face frames and ends. 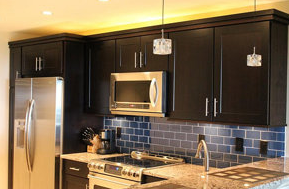 Tags: home remodeling company Cleveland, Kitchen Remodeling, remodeling tips.